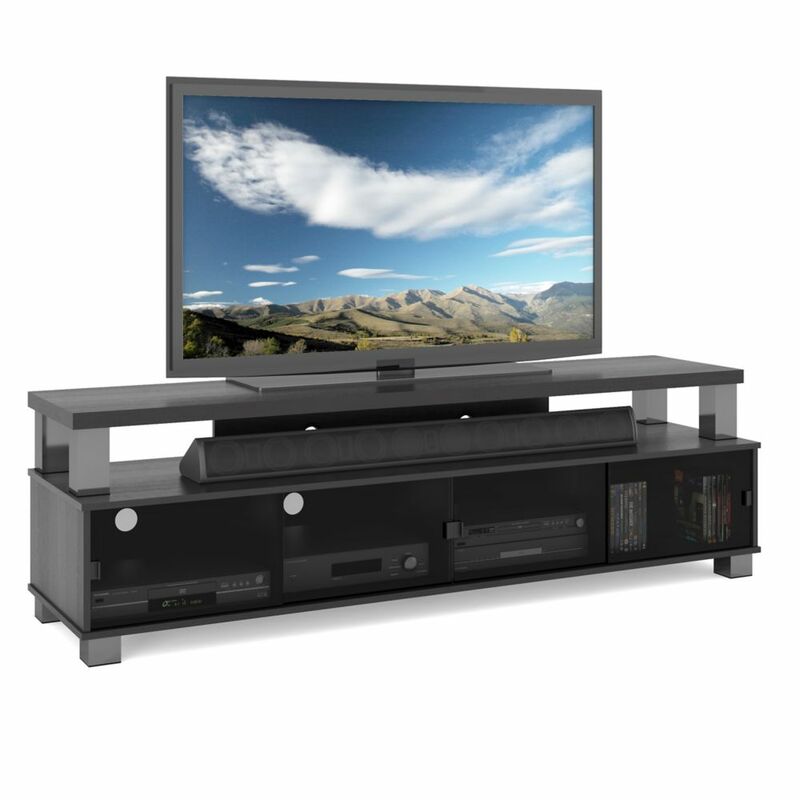 Give your living room an elegant update with the Sauder Regent Place Panel TV Stand in Estate Black. This television stand features glass doors and exposed shelves for plenty of storage space for DVD's, books, picture frames, audio equipment and more. This piece supports televisions up to 52 inches in size. B-003-RBT Bromley 75 inch 2 Tier TV Bench in Ravenwood Black Show off your flat screen TV with this sleek extra wide bench from the Bromley Collection. Featuring a rich Ravenwood Black finish with sleek Gun metal posts, this spacious two tier design offers the ideal open space for your sound bar and audio equipment. Sliding tempered glass doors safely conceal your components and accessories while the convenient cable management system maintains a clean and polished look in your home. Built to accommodate most TVs up to 80 this spacious design sets the perfect stage for your home theatre display. B-003-RBT Bromley 75 inch 2 Tier TV Bench in Ravenwood Black is rated 3.0 out of 5 by 1. Rated 3 out of 5 by Foody from Meh Wood quality is a bit inferior, and easy to crack, chip. But for the price it does its job.